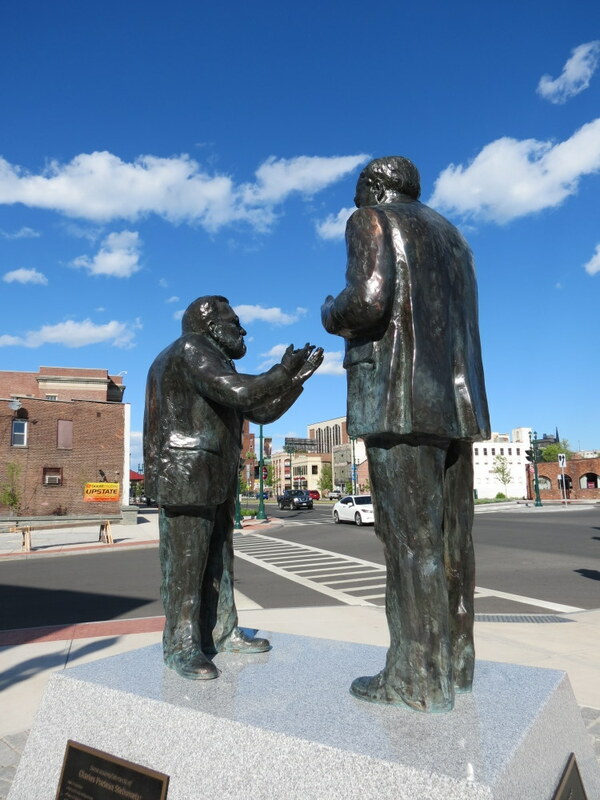 Statues of Thomas Alva Edison and Charles Proteus Steinmetz were unveiled this morning on a single pedestal, in a pocket park at the corner of Erie Boulevard and South Ferry Street, a few blocks from the main SchenectadyGeneral Electric plant. The pair, who laid the foundation for the global giant GE, were inventors and close friends, and are often called the “Fathers of Electricity”. The plaques on each side of the pedestal tell about the two men and their accomplishments. I missed the ceremony, but both the Albany Times Union and the Schenectady Gazette have photo galleries of the event. 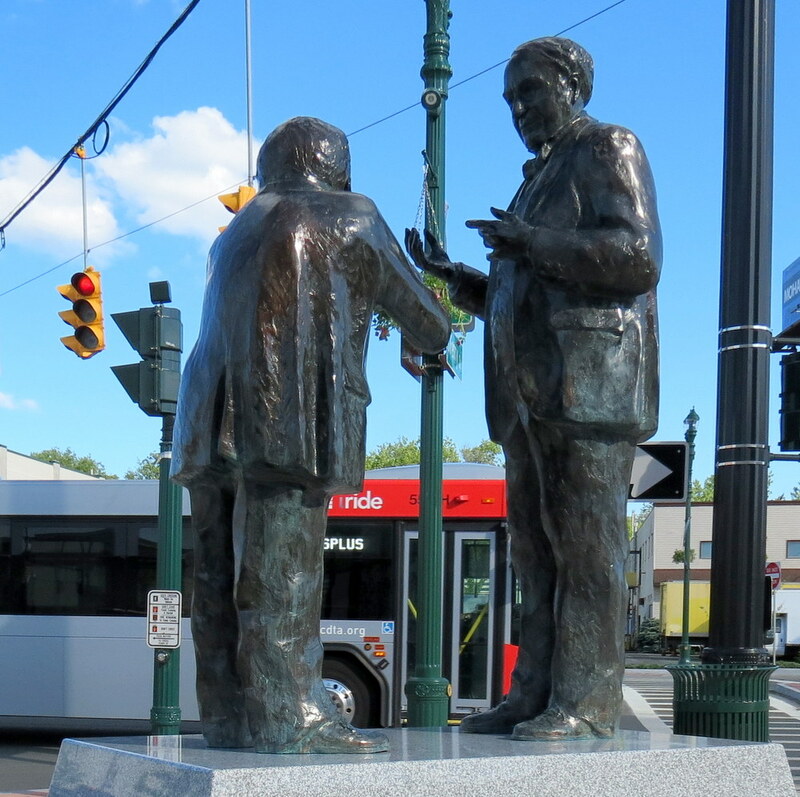 See “Statue of Edison, Steinmetz unveiled in Schenectady“, (Albany Times Union, May 22, 2015); and “Edison, Steinmetz statues unveiled in Schenectady” (Gazette, Mar 22, 2015). The TU tells us that the wind blew the canvas off the statutes prematurely, while Assemblyman Angelo Santabarbara was addressing the crowd. Decide for yourself whether wind power was making itself known. 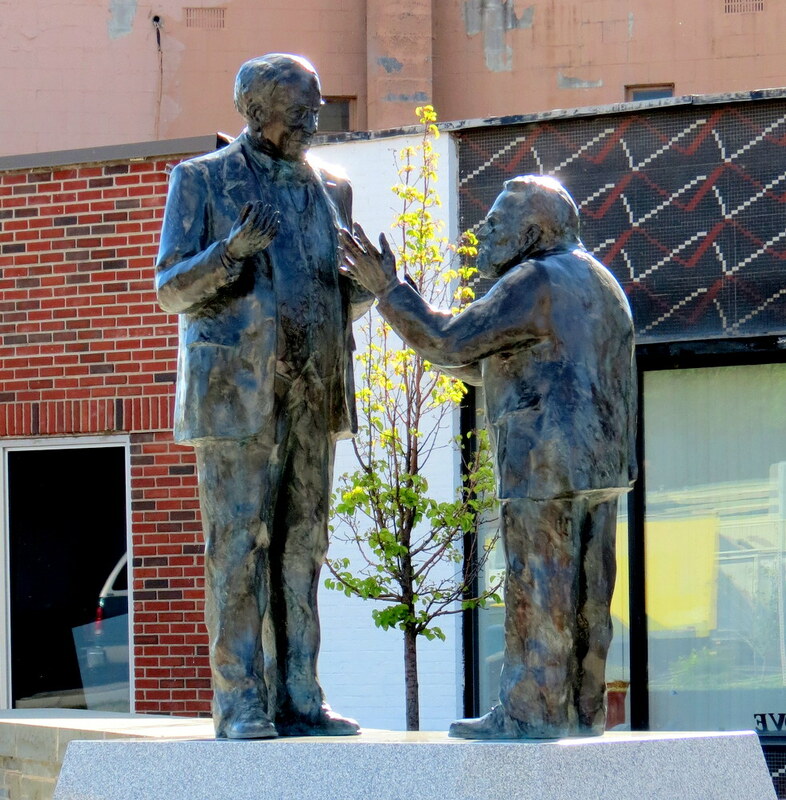 Dexter Benedict, a sculptor and owner of the Fire Works Foundry in Yates County, created the statues. Last month, Brian Merriam, the Schenectady native and local businessman who led the campaign to erect statues of the prolific inventors, said: “This is about 100 years overdue.” “Edison, Steinmetz statues slated for park near Schenectady GE” (Schenectady Daily Gazette, by Bethany Bump, April 10, 2015). The blue skies and puffy white clouds lured me out late this afternoon to welcome Edison and Steinmetz to our neighborhood. 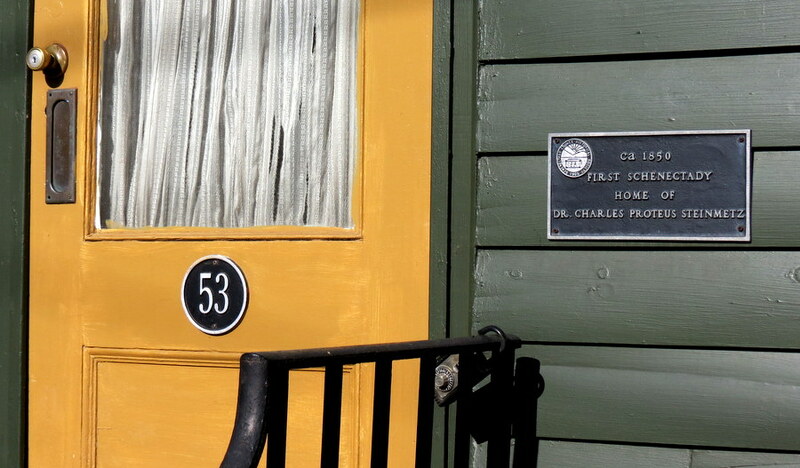 They stand only four block down Ferry Street from the Stockade’s beloved Lawrence the Indian. The following Slideshow has a few perspectives on the new statues. 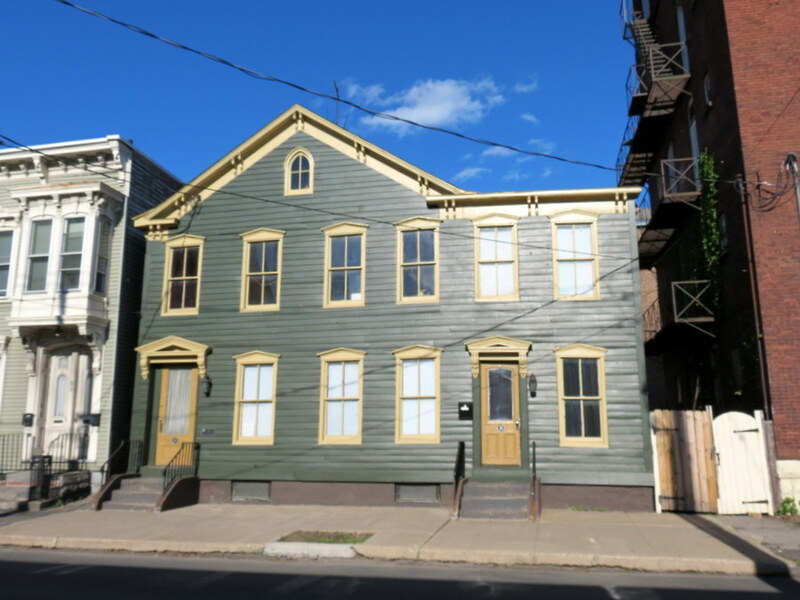 Above: photos of Steinmetz’s first Schenectady home, 53 Washington Ave. in the Stockade (click to enlarge the images). p.s. 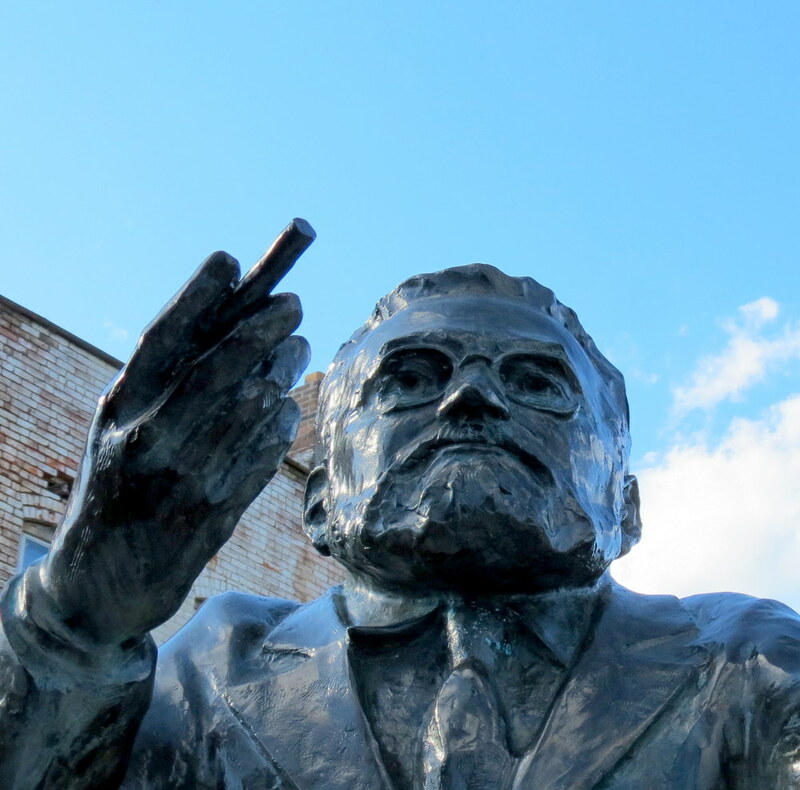 That’s a cigar in Mr. Steinmetz’s hand, not a commentary on the folks taking over the site of the old ALCO plant and claiming the legacy of GE and ALCO. You are right to say they thought Schenectady = doormat. Ps: I am the author of a text on design. Hello, Stephen. Thank you for stopping by and leaving your comments. I did not notice you had migrated over to my other active website, and could not find your comment at StopTheSchenectadyCasino to approve it. No one at all said even one good thing about the boring first design until Rush Street came up with the second one. I had a lot of negative things to say about that first one, and was not thrilled when they simply took the Des Plaines design off their own shelf and changed a couple surface elements. One thing for sure: no one (no City) gets respect who grovels, and even the confident need to insist on being treated properly in the business world of billionaires and their friends.